Singapore – A WWF report finds an alarming gap between regional ASEAN financial institutions and the environmental, social and governance (ESG) standards adopted by their international counterparts. Moreover, WWF reports a similar shortfall exists between regional financial regulations on responsible lending guidelines and corporate sustainability disclosure requirements as compared to their counterparts in Brazil, China, South Africa and Hong Kong. The report, released today at the Singapore Institute of International Affairs’s 2nd Singapore Dialogue on Sustainable World Resources, assesses to what degree regional capital providers are factoring sustainability issues into their lending and investment activities. It argues strongly for regional financiers to act in their own long-term interests and adopt ESG practices with urgency. It also calls for sustainable banking guidelines and more prescriptive sustainability disclosure requirements to be issued by regulatory authorities across ASEAN. The risks presented by commercial logging and plantations for palm oil and pulp are adopted as a central case in the report supporting the call to action. The industries contribute significantly to regional economic growth but are also linked to the destruction of globally important tropical forests and the annual haze blighting the region. 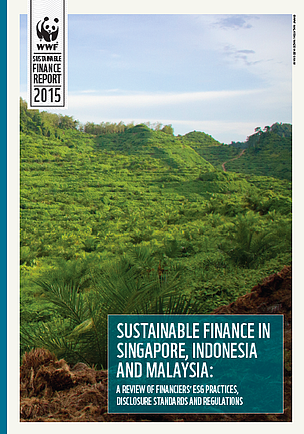 Sustainable finance in Singapore, Indonesia and Malaysia: a Review of Financiers' ESG Practices, Disclosure Standards and Regulations draws from information made public by key financial institutions. These include banks such as DBS, CIMB and Bank Negara Indonesia, and investors such as Temasek, EPF and PNB. The report highlights that banks can use ESG to strengthen credit risk management, reduce reputational risks, deepen client relationships and create new financial products. For investors, ESG can underpin investment returns as sound ESG management at the portfolio company level is linked to better operational practices and share price performance. Moreover, the performance of all financiers is linked to the economy, giving them a vested interest to address systemic risks such as climate change which can impact entire portfolios. Deforestation and forest degradation are important contributors to climate change, which should put these issues high on the agenda of financiers. The report finds regional ASEAN banks and investors are lagging on ESG issues. For example, only four out of the 18 banks analysed disclosed the use of ESG as a tool in their credit processes and only one of these four had a forest sector policy. Of the 12 domestic investors, only two disclosed their corporate governance policy, and only one of these policies refers directly to ESG expectations for portfolio companies. Low levels of ESG integration at domestic banks show the need for regulators to issue “green” credit or sustainable banking guidelines and/or require mandatory environmental and social impact assessments (ESIA) prior to loan disbursements, as is being done in China and Brazil. Low levels of ESG practices by domestic investors also suggests a role for regulators to support stewardship codes promoting responsible investment practices. Of importance, the report finds that while there is a clear case for sustainable production, only a minority of companies disclose their policies and practices. For example, amongst timber and pulp and paper companies, only 26% of companies disclose the legality of their base supply; although this is required by major EU and US markets. Similarly, only 19% of palm oil companies disclose time-bound targets to reduce GHG emissions, a glaring omission by an industry central to efforts to combat climate change due to deforestation and planting on peat, and that is vulnerable to weather changes and faces regulatory risk. The poor disclosure is partly linked to the fact that in these 3 countries, stock exchange disclosure requirements on ESG issues are too general. As such, the report calls on regulators to require the disclosure of statistical information, as is done in Hong Kong and provide detailed sector guidelines. As part of its Market Transformation Initiative, WWF is working with major soft commodity supply chain and financial actors to show that commodities can be produced at affordable costs with measurably reduced environmental and social impacts. In the light of this report, WWF calls upon regional banks, investors, and companies to adopt ESG practices using a structured framework, to be transparent and report on their progress, and to join multi-stakeholder initiatives such as (voluntary) certification schemes or industry collaborative platforms to access best management practice and support from peers. Finally, WWF urges regulators to provide national guidelines on ESG integration for banks and mandatory reporting standards for listed companies.